I’ve won more than a few bets with bartenders and others by knowing that bourbon, by definition, need not be from Kentucky. 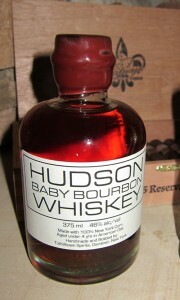 Hudson Baby Bourbon, made in the Hudson Valley an hour north of New York City, is case in point. While certainly identified with Bourbon County, the truth is bourbons have to follow only a few non-geographical rules. Most notably, it must be made from 51% corn and aged in new, charred oak barrels. Tuthilltown Distillery takes those rules to an extreme with its Hudson Baby Bourbon Whiskey. Made from 100% corn whiskey (a rarity for a bourbon), it is then aged less than two years in a new oak barrel. Using a 3-gallon barrel, instead of the industry standard 53-gallon barrel, the spirit absorbs flavor from the barrel via more surface area by volume. This results in a copper appearance and sweet flavors more characteristic of bourbon aged at least twice as long. Still, perhaps because of the limited aging, this spirit had a nose of fresh citrus and mint. And not surprisingly this whiskey is all about corn and oak. Sweet corn, vanilla, and oak are the dominant flavors. It’s hot on the roof of your mouth with a bit of smokiness. There’s also a subtle gin-like element with pine and juniper. The finish is long with maple syrup sweetness tempered only by the oak. The result is a lively spirit unlike many bourbons, but interesting and delicious nevertheless. Instead gaining depth from lots of subtle flavors, the real action with the Baby Bourbon is in the interplay between the few intense flavors, most particularly the oak imparted from the small barrel. While I’m sure it would make a fantastic Manhattan, this is a whiskey that deserves to be enjoyed neat and unadulterated with, at most, a few drops of distilled water. At $35-40 for a 375 ml “half fifth” size, it’s not cheap, but I’d go so far as to say that every bourbon lover should give it a try. Those who like cigars with their bourbon will find this a most amicable spirit for pairing. Medium- to full-bodied smokes without too much peppery bite go particularly well. My recommendations include the Ashton Virgin Sun Grown, Cohiba Siglo VI (Cuban), Nestor Miranda Special Selection 20th Aniversario Rosado Danno, Paul Garmirian 15th Anniversary, and the Ramón Allones Specially Selected. Whether with a cigar or without, as a long time New Yorker I’m proud to say that the Empire State makes this fine bourbon that stands proudly next to the best Kentucky has to offer. Good to hear New York can compete with Kentucky. Love to try it, but hate to pay that kind of price when Russell's Reserve can be had for $20-25 for twice the volume and Eagle Rare Single Barrel can be had for $30 for twice the volume. It's a tough sale for those of us on a limited budget. Dmjones- I hear you on the price. But I had this and I think it's worth trying once. Maybe find a bar that carries it and pay 12 bucks for a pour. I'm with you on everything but the last statement. While I, too, am impressed with this NY offering, it is a far cry from the finest KY bourbons such as Van Winkle and Weller.